Glass Capacity: 2 3/4 oz. Just as the white wine, the red wine and the champagne, have their own glass design to correctly appreciate and savor their kindness to the taste. 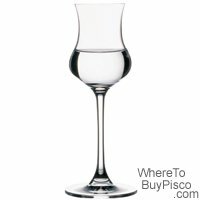 Pisco has its own specially designed glass.